The Association for Research in Vision and Ophthalmology (ARVO) has elected Jeffrey Boatright, PhD, as president. Boatright is a researcher at Emory Eye Center and an associate professor in the Department of Ophthalmology in Emory University School of Medicine. He will assume the presidency in May 2011. 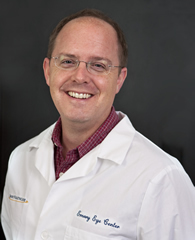 "Jeff Boatright is a terrific choice for president of ARVO, the most prestigious vision research organization in the world," says Timothy W. Olsen, MD, director of Emory Eye Center. "Jeff's extraordinary service is well recognized with his selection as president. All of us at the Emory Eye Center are very proud of his recognition and look forward to his positive influence on the organization." At Emory Eye Center, Boatright uses molecular and cellular biology techniques to study DNA repair mechanisms with the goal of using them to repair genomic DNA mutations that lead to blindness. He also uses in-vivo pharmacological approaches to explore the effects of hydrophilic bile acids and other atypical compounds on animal models of retinal degeneration and glaucoma. This work is funded by the Foundation Fighting Blindness, Research to Prevent Blindness (RPB), the Katz Foundation and the National Eye Institute (NEI) of the National Institutes of Health. Founded in 1928 by 73 ophthalmologists, ARVO's membership now numbers more than 12,500, 42 percent of whom reside in more than 80 countries outside the United States. The membership is multidisciplinary and consists of both clinical and basic researchers. ARVO encourages and assists research, training, publication and knowledge sharing in vision and ophthalmology. Within ARVO, Boatright is trustee for the Biochemistry and Molecular Biology Section and chairman of the Young Investigators Committee. This year he was tapped as an ARVO Silver Fellow, an honor that recognizes members for their accomplishments, leadership and contributions. Within the NEI, he has served on numerous study sections. He is on the board of directors for the Georgia Affiliate of Foundation Fighting Blindness and was honored as its Scientist of the Year in 2007. At Emory Eye Center, he serves as director of the Redmond-Firman Center for Glaucoma Research. He is founding and current editor-in-chief of Molecular Vision, a peer-reviewed journal dedicated to the dissemination of research results in molecular biology, cell biology and the genetics of the visual system. He has served on the Editorial Review Board of International Journal of Molecular Sciences since 2001. Boatright also holds memberships in the American Association for the Advancement of Science, the Society for Neuroscience, and the International Society for Eye Research. He is principal investigator or co-investigator for four NEI grants and four private foundation grants. Emory Eye Center has a mission to conduct pioneering research into blinding eye diseases, to educate and train eye professionals, and to provide excellent patient care. The Department includes 33 ophthalmologists, eight optometrists, 11 basic scientists, 11 post-doctoral fellows, and nine researchers in other Emory departments who hold joint appointments in the Emory University School of medicine's Department of Ophthalmology. Ophthalmology research is supported by current NIH funding of $20 million through 2010. The Department remains in the top rankings (#9 - 2009) by U.S. News & World Report for the 14 years the magazine has held a ranking for Ophthalmology. It also ranks in the Top Ten in the peer-reviewed Ophthalmology Times annual report.